16 July 2013 - Vancouver, Canada - fSONA Networks, manufacturer of the fastest optical wireless products on the market today, today announced that their SONAbeam product line has undergone real-world testing by mobile network operators using the CPRI (Common Public Radio Interface) specification to extend their reach without having to establish new basestation locations. CPRI is a publicly available specification that was developed through industry cooperation amongst major operators and equipment manufacturers including Ericsson, Huawei, NEC, Nokia Siemens Networks and Alcatel-Lucent. 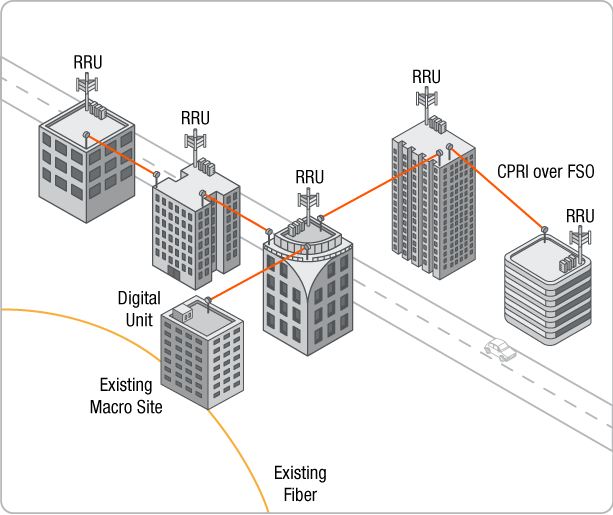 CPRI gives mobile operators more flexibility by allowing the use of a distributed architecture where basestations can be located remotely and a lossless link carries the CPRI data. The CPRI specification was designed to use fiber and therefore has stringent performance requirements particularly when it comes to latency. It demands a high capacity connection that operates with extremely low latency and packet loss. FSO meets the demand for high datarates as well as near-zero latency and packet loss. Current SONAbeam systems can support CPRI Options 1, 2 and 3 (614.4 Mbps, 1228.8 Mbps and 2457.6 Mbps, respectively). "SONAbeam from fSONA has proven to be a superb option for mobile networks using CPRI. Of the three technologies suitable for CPRI transport: Metro Fiber, High Capacity RF/E-Band and Free Space Optics (FSO), FSO is the only option that is viable all over the globe and can be deployed rapidly," observed Paul Erickson, Chief Technology Officer of fSONA Networks. "In an ideal world, every radio unit would be connected to fiber but in many locations fiber is impractical or overly expensive. E-band is an option for some operators but it is only available for use in certain parts of the world with widely varying spectrum licensing models and also suffers from higher latency than fiber or FSO." With FSO, units can be mounted directly on the tower or building, next to the remote radio. FSO's ease of installation and lack of lengthy licensing negotiations or trenching make it the ideal solution to quickly and effectively reach new markets. FSO equipment can be installed rapidly, usually in less than a day, and can be moved if network demands shift.